Define any number of “accounts” (addresses, measuring sources with volume specifications, etc). Each measurement performed with the PrimeLab is assigned to such an “account. Transfer of 20 “Accounts” to the PrimeLab per mouse click. Synchronization of measurement data between the PrimeLab and the “PrimeLab Desktop Assistant”. Convenient reporting function for printing results; account-related, selected by date and / or parameter. 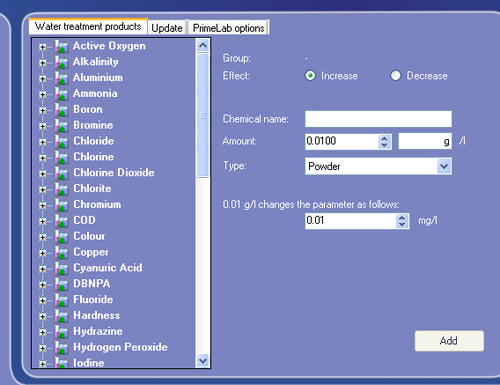 You can input the water treatment chemicals that you use and ideal ranges for each parameter you can get dosage recommendations calculated, view them and print them. Store your individually used water treatment chemicals (e.g. “pH Minus”). Store ideal ranges for each measurement parameter (e.g. “pH 7.2 – 7.4”). 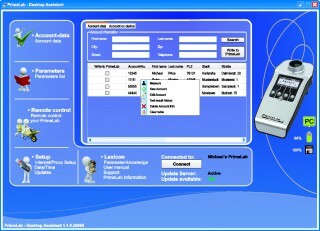 Monitor controlled environment areas such as freezers, storage areas and other critical areas. Store humidity and temperature historical data for report generation. Subsequent uploading of additional parameters on the PrimeLab by entering a code into the software. Remote control of the PrimeLab. Overview of all methods of measurement with display of measurement ranges and stored ideal ranges. Definition of customized ideal ranges per parameter. 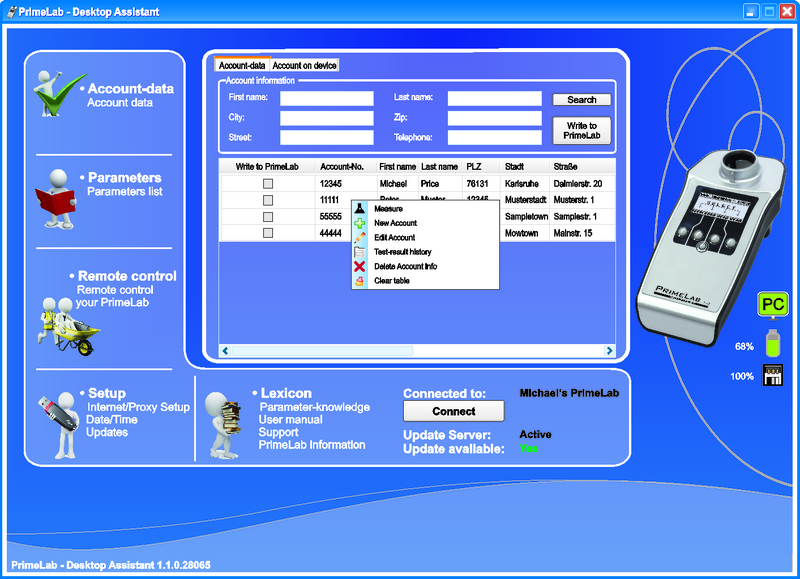 Update of the PrimeLab firmware and the “PrimeLab Desktop Assistant” software by mouse click. Personalisation of the PrimeLab / individual naming of your machine. Setting date and time / Internet access / reset to factory default values. Networking with other users via the forum on www.PrimeLab.org. Extensive information on water per parameter in the section “Glossary”. Connection of multiple PrimeLabs to the software. The PrimeLab is equipped with a Bluetooth® module and connects automatically with the user’s PC, in the same way as smartphones connect to a car kit. In addition, the PrimeLab can be controlled by its own software, the “PrimeLab Desktop Assistant”. 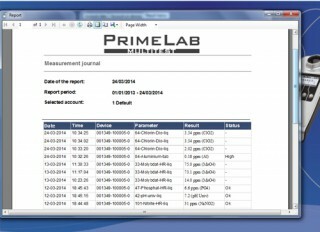 The free “PrimeLab Desktop Assistant” software permits storage of address data (accounts) with information on the sample water origin (e.g. “50 m³ pool”). Calculated water values, which are always assigned to “accounts”, can be managed historically, printed, compared and interpreted. 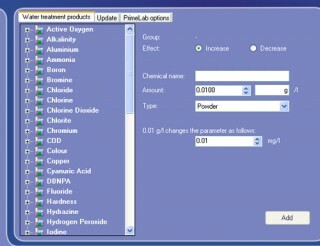 Additionally, the software recommends the dosage for the individual water treatment chemicals (if the details for which have been entered into the appropriate account), in order to restore ideal water parameters. The user can individually set the range of “ideal water values”, too, for each parameter. Via the “PrimeLab Desktop Assistant” software and an existing internet connection both the software and the firmware can be updated at the press of a button. Even if additional parameters are required at later date, this is very easily possible by purchase of a code and subsequent activation via the software.